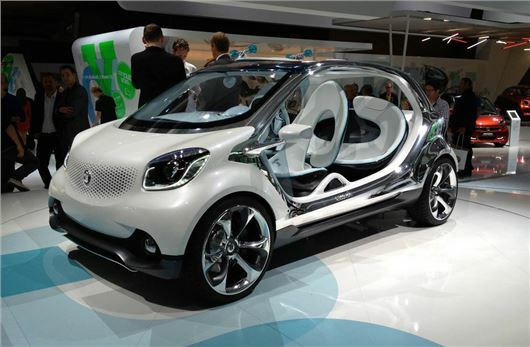 Smart has unveiled a new concept car which at the Frankfurt Motor Show. Called the Fourjoy, it's the first new design from the brand for years and shows what the next generation of Smart models will look like, starting with a new ForFour due in late 2014. The old ForFour - which shared a chassis and engines with the Mitsubishi Colt - was never a big seller, not helped by high prices and some below par interior plastics. It wasn't exactly a joy to drive either. 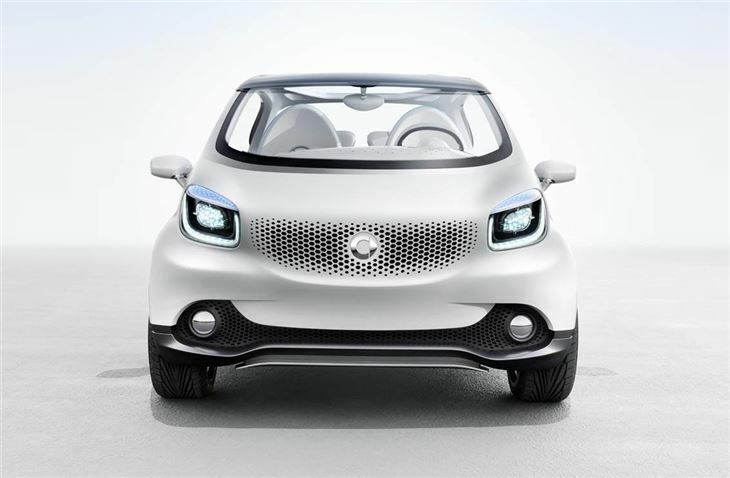 But Smart is promising a bit more sparkle in its successor which will come from this concept. 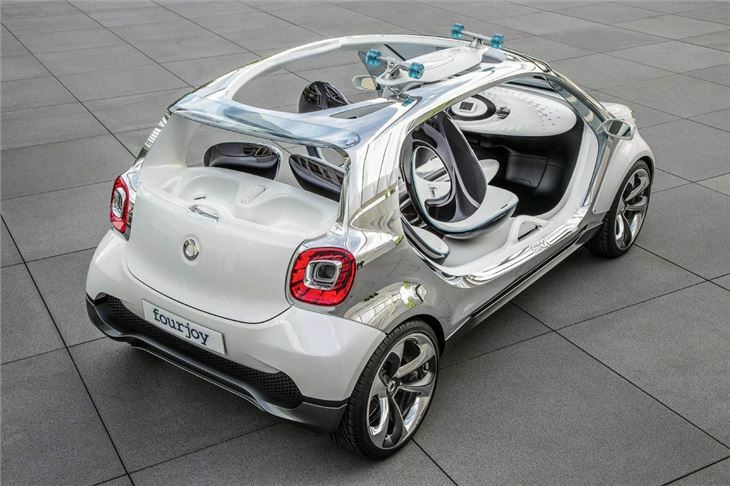 The Fourjoy has no doors, no rear window and an open roof - in fact it's very reminiscent of the Renault Twizy - but unlike the French car, the Smart has room for four people. Like all Smart models however, it's still small with an overall length of less than 3.5 metres and echoes some of the styling of the Smart ForTwo with short overhangs and a bluff front end. It's powered by a purely electric drivetrain with a 55kW magneto-electric motor running off a lithium-ion battery with a capacity of 17.6 kWh. When completely empty it takes a maximum of seven hours to fully charge the battery at a household socket or charging station. Charging time at a wallbox or public charging station can be shortened to less than one hour with the 22 kW on-board charger and a rapid charging cable. As you'd expect of a concept there are some quirky features. 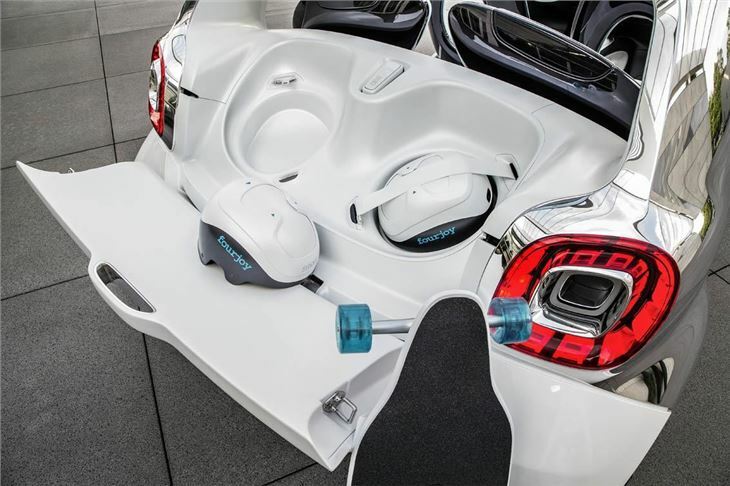 In this case two electric skateboards which are fastened on the roof. Inside there's a spherical instrument cluster and a single-spoke steering wheel reminiscent of the original Smart.